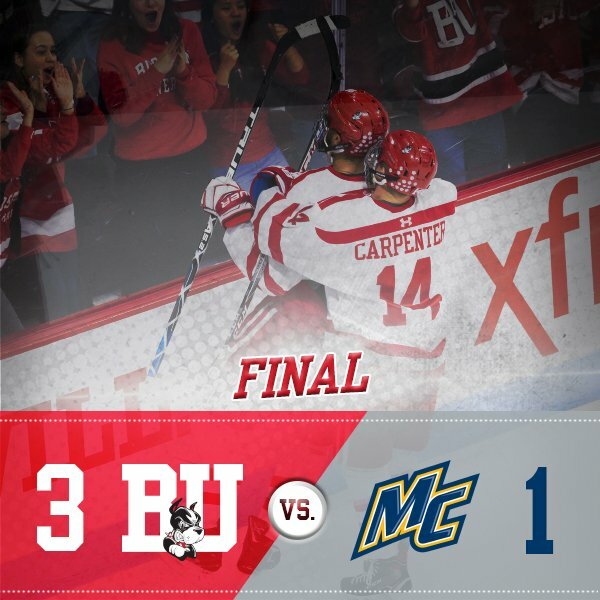 Junior Bobo Carpenter scored twice—his second multi-goal game in eight days—and added an assist, earning first-star honors in BU’s 3-1 win against Merrimack. The Terriers also received a goal from Brady Tkachuk, while Jordan Greenway assisted on two scores, as BU swept the weekend series with the Warriors. BU has won three and tied one in its last four games as it has pulled into a tie for third place with Providence in the Hockey East standings. The Terriers also evened their season record at 11-11-2. Terriers got on the board at 12:28 of the opening peroid with the first of its two power play goals. Greenway slid a pass to Tkachuk to the right of goalie Drew Vogler and he stuffed it home. Four minutes into the second period, BU stripped the puck from a Warrior at the defensive blueline and Ty Amonte pushed it ahead to Shane Bowers. The Nova Scotia native sped into the zone and centered a pass to a streaking Carpenter at the goalmouth for the finish. BU maintained the 2-0 lead until late in the period when Merrimack scored on the rush with Ludvig Larsson converting a two-on-one pass from Cole McBride. Midway through the third period, BU restored the two-goal lead on its fourth power play of the game. Greenway took a pass from David Farrance and then found Carpenter in the slot for a wrist shot that beat Vogler high to the glove side. Longtime Terrier Equipment Manager Mike DiMella marked his 1,000th game and was recognized during the game. The game also marked BU’s annual Autism Speaks Night. BU has partnered with Autism Speaks for 14 seasons and participates in numerous fund-raising activities. 2018 recruit Jack DeBoer scored his seventh goal—and third in the last four games—in the NTDP U18s’ 4-3 win against Chicago. 2019 recruit Robert Mastrosimone scored his eighth goal for the Steel. 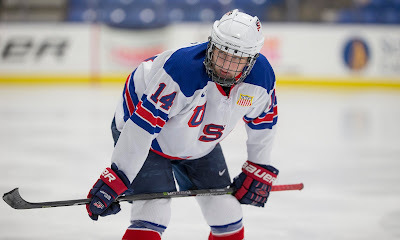 2019 recruit Trevor Zegras scored a pair of goals in the NTDP U17s 6-3 win against Sioux Falls. The 5-11 center from Bedford, NY has a 10-17-27 line in 30 games. Clayton Keller registered a pair of assists—his 21st and 22nd –in the Coyotes’ 5-2 win against St. Louis. Nick Bonino scored his 7th goal of the season and added two helpers as his Nashville Predators defeated the Florida Panthers 4-3. Jakob Forsbacka Karlsson scored his 12th goal in the Providence Bruins’ 3-2 loss to Bridgewater. Danny O’Regan assisted on a pair of goals in the Barracuda’s 3-2 win against San Diego. Terriers travel to Storrs, Connecticut for their second meeting of the year with UConn. Puck drop is at 2 p.m. BU and the Huskies played to a 2-2 tie last November with Captain Rebecca Leslie scoring the tying goal with less than a minute left in regulation. ● GoTerriers.com preview, Live Stats.